I recently had a brief conversation with fellow reviewer Camus about contextualising movies to their time and place, one that made me more aware of how difficult the process of doing so actually is for many people. It's not just that we're looking at images and filmmaking styles and performances that are different to the ones we use to define the present norm, but that they often feel like primitive versions of what we see today, the present style in development so to speak, something heightened in older films by the condition of the prints and the use of monochrome over colour. It's understandable to a degree, as I discovered when I screened D.A. Pennebaker's genre-defining Dont Look Back to a class of young media students a few years ago. For a generation who have grown up with rough-hewn hand-held camerawork of modern documentary and even drama works, it proved hard to appreciate the groundbreaking nature of Pennebaker's film when to their media-weary eyes it was similar to what they see on TV almost every day, only dingier and fuzzier and featuring a singer they were only vaguely aware of through their dad's record collection. One of the group I showed an extract to was particularly scornful, not of the filmmaking itself but Bob Dylan's use of the word 'cats' as a hip term for people. I felt compelled to point out that the slang used by her own generation will likely seem every bit as ludicrous to the one that follows when they redefine what constitutes the language of cool. And yes, I am aware that even this term has been repeatedly superceded by a number of temporary stand-ins. Surprisingly, perhaps, I've never really had any problem contextualising films. I became hooked on silent cinema at an early age precisely because of their unique look and feel, and had just enough viewing experience and knowledge of film history to be aware of at least a spattering of contemporary works to judge any such film by, or rather to more effectively form my own opinion of it. But one of the of the joys of cinema is that there's so damned much of it, and even if you've been watching everything you could for years on end, you'd still have seen only a fraction of what's out there. Retrospective film investigation is thus full of surprises, joyous jolts to your expectations of a period or a country or even a particular filmmaker. It's the sort of unique thrill that anyone discovering the films of F.W. Murnau, G.W. 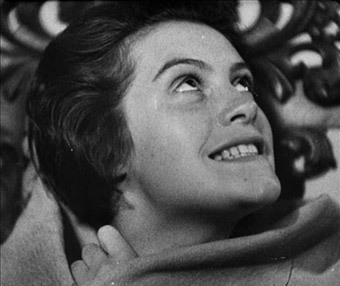 Pabst or early Fritz Lang for the first time will experience in abundance, and if you're unfamiliar with the early films of Carl Theodor Dreyer, get ready for a similar expectation-busting buzz. I first saw Dreyer's extraordinary 1932 horror film Vampyr (full title: Vampyr: The Strange Adventure of Allan Gray) so many years ago that I can only pinpoint the decade, and have remembered so little about it that this new DVD was almost like coming to the film for the very first time. Almost. One sequence had burned itself so indelibly into my consciousness that I was able to remember it almost shot for shot, accurately so as it turned out. As a young (and possibly ex-) film student, I was startled by the use of a technique I did not readily associate with films of this period. Later as a film devotee of many years standing I remain struck by the scene for the same reasons, but also because I've never seen it repeated since, at least anywhere close to this effectively. I'll get to this sequence later, but I'm guessing that those familiar with the film will probably already have a good idea of the one I'm referring to. But then, there's still plenty of room for speculation. The thing is, you see, Vampyr doesn't just have one groundbreaking scene. It's full of them. 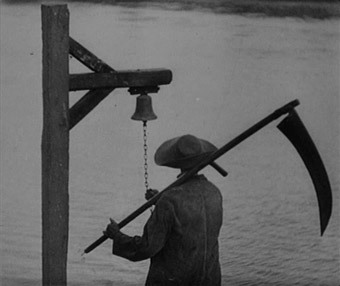 On paper the plot of Vampyr has a generically familiar ring, but do remember that we're talking 1932 here (the film was actually shot in 1930), and aside from Murnau's Nosferatu – by then effectively a lost film – we're at the very dawn of the movie vampire genre before the rules had* been set. Dreyer's film was completed before Universal's genre-defining Dracula hit world cinemas, but its release, to the director's understandable annoyance, was held back by the distributor until the Hollywood Dracula and Frankenstein movies had done their rounds. It's also worth noting that the inspiration for Dreyer's film was not Bram Stoker but Sheridan Le Fanu, whose genre writings predated Stoker's by several years and were a direct influence on Dracula. At all begins when Allan Gray arrives at a secluded riverside inn situated in the hamlet of Courtempierre. Unlike his contemporaries in Nosferatu and Dracula, Gray has not travelled there for a specific purpose, nor is he driven by ambition or duty. He is, the opening caption informs us, "lost in the border between reality and the supernatural," the result of his fascination with the demonology and vampire lore. Evidence of supernatural activity is all around, and the danger it represents is suggested when Gray receives an unexpected and unsettling visit from the ageing Lord of the Manor, who issues an ominous warning and leaves a package that is only to be opened on the event of his death. It's a demise not long in coming and one witnessed by the curious Gray, who then becomes involved in the threat faced by the man's family, the work of an ageing female vampire and the collusive local doctor, whose collective power now threatens the lives of the man's two daughters, Gisèle and Léone. A few recognisable touchstones for the genre familiar there, and there are more to come, notably in the climactic stake through the heart and the nature of the package left in Gray's room, a book on vampires that outlines their nature and how to dispose of them. It's a plot device also employed in Nosferatu and whose visual presentation of the text contained within clearly identifies this film as one made during the transitional period from silent to sound cinema (the film was shot silent and its soundtrack post-dubbed in three languages). But, as is pointed out on the second commentary track, the magic of Vampyr is not in the tale itself but in the extraordinary manner of its telling. As a contemporary of Tod Browning's genre-defining adaptation of Dracula alone, Vampyr makes for fascinating comparative viewing. 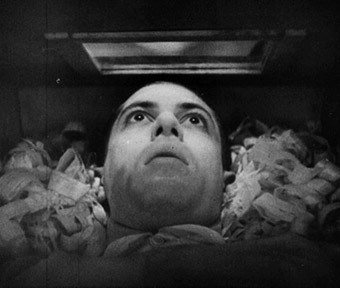 Whereas Dracula was adapted from a successful stage production and retained a little too much of its staid theatricality, a key influence on Vampyr appears to be the early surrealist film works, not for specifics of incident but their dreamlike atmosphere and sometimes fragmented approach to narrative. This difference of influence is reflected in the visual style. 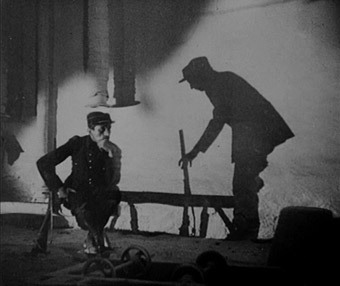 Both films employed the talents of master cinematograhers who would go on to become directors themselves, but where Karl Freund's camera remained immobile for much of Browning's film (when it did move, however, the results were memorable), Rudolph Maté's is almost constantly in motion, always with purpose, and often with a disarmingly modern aesthetic. Considerably more daring and visually adventurous than Dracula, Vampyr also, if you really put the film it its appropriate time/place context, leaves almost every vampire movie that followed looking a little anaemic by comparison. Take Gray's early investigation of a run down and seemingly deserted factory building. The journey there is disconcertingly peppered with ownerless shadows, including that of a gravedigger whose actions are running in reverse (seriously, in the context of this fruitful sub-genre, this image alone invites a sizeable paragraph of subtextual analysis). On reaching his destination, Gray encounters the disembodied shadow of a one-legged man, whose journey through the building eventually reconnects it to its lost-in-thought owner, allowing the two to depart in unison. Shadows figure prominently throughout the film as representations of the spiritual aspect of the vampire, a dark trace of the human that once was but still capable of taking a life. However, as Tony Rayns rightly suggests, the scene in which the Lord of the Manor is murdered could be intended to be read symbolically rather than literally. If you like your narrative readings straightforward then be warned, as almost every scene is open to multiple and often complex interpretation. The film reaches a peak of imaginative boldness in its most justly celebrated sequence and the one that stayed so vividly with me over the years. It kicks off when a daydreaming Gray breaks into two semi-transparent entities, one of which discovers his own corpse laying wide-eyed in a coffin that is being prepared for burial. Except he's not dead. How do we know this? 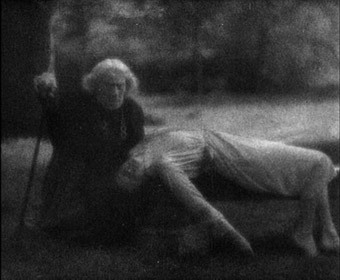 Because Dreyer shoots the bulk of the scene from the viewpoint of Gray's imobilised body, as the windowed lid of the coffin is lowered and screwed into place, as the ageing vampire looks down at him, and as the coffin itself is carried through and out of the house and towards its place of burial. Not only is this sequence astonishing for its time, it remains uniquely disturbing to this day, brilliantly communicating a very specific terror that few would probably be aware they were susceptible to until they see it presented in this manner. It works so well in part because it touches on a very tangible fear that a good many of us will have inadvertently flirted with – the upward views of passing doorways and downward-glancing characters as the camera-in-the-coffin is carried past them will be all too familiar to anyone who has been wheeled along to an operating theatre, an experience strongly linked to helplessness and approaching enforced unconsciousness. And I know of few who have been through it who've not felt just a flicker of fear that they might never wake from this deepest of sleeps. With the majority of action presented from Gray's viewpoint, you'd expect the central performance to an audience-engaging one, but the role of Allan Gray is taken not by an experienced actor but by Julian West, aka Baron Nicolas de Gunzburg, the aristocrat who funded the film in exchange for playing the lead role. Much has been made of his near-expressionless performance, but for me it perfectly suits the film's surrealist overtones – more than once West reminded me of the suited protagonists of Un Chien Andalou, and his wide-eyed confusion seems just right for a man lost between the real world and that of the supernatural. When a strong performance is needed, though, the film gets it in the shape of Sybille Schmitz as Léone, who in one of the film's most skin-crawlingly creepy sequences, facially transforms herself from an injured innocent to a demonic monster without for a second overplaying the role (that she is sitting upright in a chair as she does so can't help but prefigure the scene between Regan and the psychiatrist in The Exorcist). It's a shot that also typifies Dreyer's consistently superb use of close-ups to connect us with character or to draw our attention to (and occasionally misdirect us with) detail. The imperfect print and inconsistent monochrome image quality may prove off-putting for some, but for my money this is a key aspect of the film's still-potent ability to get under your skin in genuinely unsettling manner, adding to its nightmare quality and visually aligning it with the early surrealist cinema it draws influence from. I seriously can't imagine any of this working anything as well in pin-sharp, CG-assisted colour, which apart from anything else would seriously dilute Dreyer's use of the binary oppositional forces of deathly shadow and liberating whiteness, a religious metaphor put to particularly powerful use at the film's end. Seriously undervalued on its release, the true greatness of Vampyr has only been fully appreciated with the passing of time. That it stands out so starkly from its contemporaries is one thing, but seventy-six years after its release there's still been nothing quite like it, not just in the vampire genre but in cinema as a whole, and I'm just scratching the thematic surface with the above. Its technique alone is cause for fascination – there are camera movements and effects here that dazzle in their complexity and execution – and I can think of few other films of this vintage that can still give me the serious creeps on every viewing. Tod Browning's Dracula may well be the film that launched the vampire genre, but it's Dreyer's bolder, infinitely more imaginative and adventurous film that has best stood the test of time, and as such is more deserving of classic status. Put the words 'Masters of Cinema' and 'Restoration' together and your expectations can soar to unreasonable heights, based largely on the miraculous work done by the Murnau-Stiftung studio in Germany for MoC's 2-disc release of fellow genre giant Nosferatu. Like Nosferatu, all of the original negatives for Vampyr have been lost, but unlike the Nosferatu the reconstruction of Vampyr was carried out in 1998, when digital film restoration software was still in its infancy. For the team responsible there were other issues to cope with, too numerous and complex to quote here but detailed with admirable clarity in the booklet that accompanies this DVD. As a result the film has been restored and cleaned up but is still a long way from pristine, and without a sizeable investment of time and money on the part of a dedicated restoration house, the print here is unlikely to be improved on in the immediate future. Many of the faults here will be familiar to any student of silent cinema – the contrast varies, the exposure flickers, sharpness can vary from shot-to-shot and dust spots are ever-present, occasionally joined by a scratch or some blink-and-you'll-miss-them holes in the print, all things that modern digital restoration techniques are able to at least partially correct. 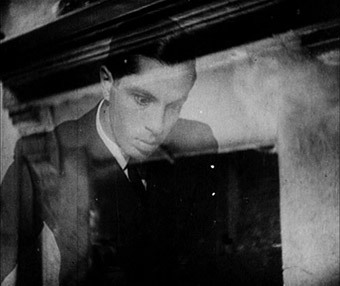 Some of the exteriors appear to be in particularly fuzzy condition, but before you get too judgemental here you should know that this was a deliberate effect, discovered accidentally by Dreyer and achieved by Maté by shooting through backlit gauze in order to give these shots an indistinct, fog-like appearance that the film's age and condition can make seem like damage. Safe to say that the film looks its age, but the contrast and detail are still intermittently impressive and the considerable improvement on previous prints can be measured by Guillermo del Toro's description of the present print as "beautiful." The transfer retains the film's original aspect ratio of 1.19:1, which pillarboxes the print slightly even on a 4:3 screen. The mono soundtrack is as you'd expect from a film made at the very start of the sound era, with a limited dynamic range and an inevitable degree of background hiss, but it's mercifully free of unexpected pops and bangs resulting from damage to the soundtrack, and the clarity of the music in particular is surprisingly good. Extra features on Masters of Cinema discs are almost always of high quality but rarely that plentiful, but Vampyr seriously raises the bar, particularly for a single-disc release. A major coup for the Masters of Cinema series, given that no such track appeared on the recent US release by Criterion, who must be kicking themselves for letting this one slip by. One of the leading fantasy filmmakers working today – his films include The Devil's Backbone and Pan's Labyrinth, as well as two genre-advancing vampire movies, Cronos and Blade 2 – del Toro has both a passion for and an extensive knowledge of the genre in which he works and has a particular love for Vampyr, which he believes is Dreyer's masterpiece. As with all of the best del Toro commentaries, this is both bristling with detail and entertaining – up front he describes his contribution as "the equivalent of inviting a fat Mexican to your house, feed him, and then you have to listen to him for mercifully a short time and then disagree, agree, insult or share any of my opinions." Del Toro sees the film as a cinematic memento mori, and don't worry, he provides a full history of that particular artistic genre, along with a detailed examination of the film's style and complex substructure, particularly, as a Catholic, its religious reading. There are some lovely moments in here, notably his assertion that Jean Cocteau was a magician but Dreyer was a prophet, and his gorgeous description of the surrealists as "beautiful savages of the id." Wouldn't you love to have said that? I was also amused (although perhaps a little deflated as I thought I'd scored a minor coup) that I was not the only one who'd spotted the similarities between the village doctor and Professor Abronsius in Roman Polanski's The Fearless Vampire Killers and the death of a bad guy in Peter Weir's Witness to the manner in which the doctor meets his end. The great thing about both of these commentaries is not only are they completely pause free, but there is almost no duplication of information, a rare an much appreciated thing for multiple commentary discs. The restored print on this DVD is of the German version, which received cuts to two scenes by the German censors on its release. The cut shots survive in the French language version but with soundtrack problems, which made it difficult for the restoration team to re-insert them into this print. They've thus been included as an extra feature, a relief given the build-up to their importance provided by both Rayns and del Toro. Once again the hope is that modern digital restoration technology would enable the film to be fully reconstructed at a later date. Not content with going one up on Criterion with the del Toro commentary, Masters of Cinema have also licensed from them this documentary exploring what influenced Dreyer to make Vampyr, commissioned specifically for the recent Criterion US release of the film. A scholarly affair, but in a good way, it provides yet more information on the production and visual evidence of some of the points raised by the commentaries, and also includes a number of archive photographs and some interview footage from the Jøgen Roos documentary detailed below. A specially made 14 minute documentary, written and narrated by Craig Keller, that delves into the life of Baron Nicolas de Gunzburg and uses previously unseen archive footage and newly shot location photography. Or so the caption introducing this particular extra assures me, as this extra wasn't quite completed in time for the preview discs but will, we are assured, appear on the release disc. A Danish-made interview with Dreyer conducted towards the end of his career after the French premiere of his final film, Getrud, in which the director discusses specific points about each of his films in turn, which are illustrated with extracts of a decent length. The sequences in which he talks about Vampyr are incorporated in their entirety in the Casper Tybjerg documentary above. Included here is footage of the Gertrud premiere, which includes brief interviews with admirers François Truffaut and Henri-Georges Clouzot, and we get to see Dreyer encourage an apprehensive Jean-Luc Godard to attend a directors' dinner. Another handsome MoC booklet includes extracts from and partial reproductions of the original Danish film programme (the entire plot is included in the summary, so don't read this before watching the film for the first time), a sizeable essay entitled Film Production – Carl Dreyer by Jean and Dale Drum from their book My Only Great Passion: The Life and Films of Carl Th. Dreyer, an essay on Vampyr by Tom Milne from The Cinema of Carl Dreyer, some welcome notes on the restoration by Martin Koerber, a large collection of production stills and the usual film credits. I am, as anyone who has trudged through my reviews of Nosferatu and Universal's Dracula films will be only too aware, something of a vampire movie aficionado, and in that capacity I'm going to make a bold statement, but one I'm happy to defend in debate: if Nosferatu remains the greatest of all vampire movies, then I'm willing to vouch for Vampyr as the biggest threat to its crown, and for me it remains the most imaginative, exciting and poetic work the genre has yet produced. As for the DVD, well the print my not have had a Nosferatu-style restoration, but this is still as good as the film has looked in decades, and the quality and quantity of the extra features still make this a superb disc, and one of the finest releases yet from Masters of Cinema. Highly recommended.